My new favourite meal. Ever. Do you like that extra u in the title? Favourite. That's how the Brits spell it and I still have my laptop set to the English - UK setting. I'm just super classy like that. Okay. Food. The reason we've all gathered here today. As the title alludes to, I have found a new favourite recipe (or two). It's delicious. I like it so much I ate it last night for dinner and polished off the leftovers today for lunch. and get this - I was so anxious to eat it that I forgot to take pictures BOTH times. But don't freak out! I've adapted these recipes from Gina at SkinnyTaste.com so if yours looks like hers, you know you've done something right. 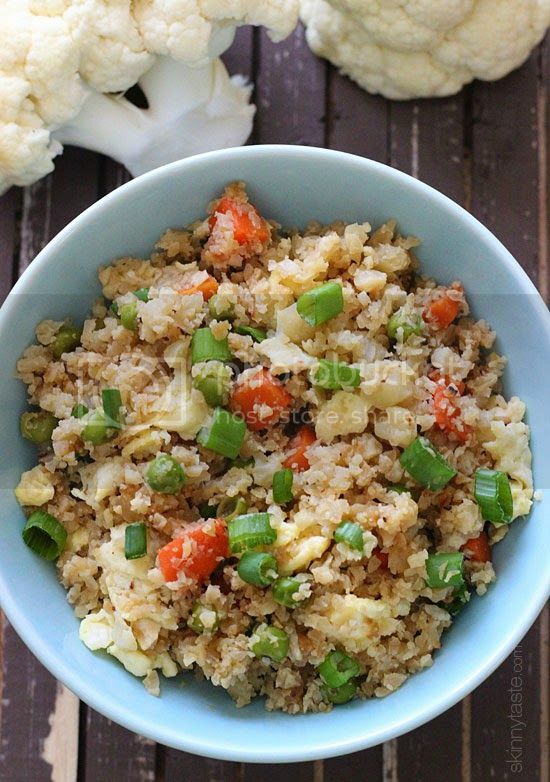 First, we have the warm, comforting base: Cauliflower "Fried Rice"
And no, those are not misplaced quotation marks, because, there is absolutely zero rice in this recipe! 1. 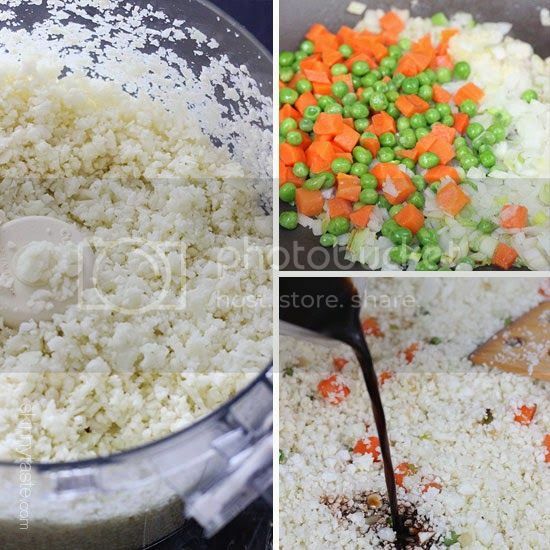 Coarsely chop cauliflower into florets, then place half of the cauliflower in a food processor and pulse until the cauliflower is small and has the texture of rice – don't over process or it will get mushy. 2. Set aside and repeat with the remaining cauliflower. 3. Combine egg and egg whites in a small bowl and beat with a fork. 4. Heat a large sauté pan/wok over medium heat and spray with oil. Add the eggs and cook, turning a few times until set; set aside. 5. 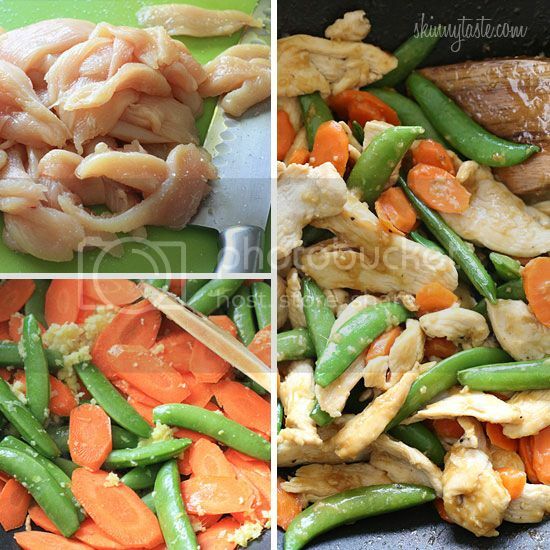 Add the coconut oil and saute onions, scallion whites, peas and carrots and garlic about 3 to 4 minutes, or until soft. 6. Raise the heat to medium-high. Add the cauliflower "rice" to the saute pan along with soy sauce. 7. Mix, cover and cook approximately 5 to 6 minutes, stirring frequently, until the cauliflower is slightly crispy on the outside but tender on the inside. 8. Add the egg then remove from heat and mix in scallion greens. 1. Combine soy sauce, lime juice, and water in a small bowl, mix together and set aside. 2. Heat a large wok over medium-high heat. 3. When the wok is hot, add half of the oil, then add the chicken. 4. Stir occasionally until the chicken is cooked through and browned, about 3-4 minutes. 5. 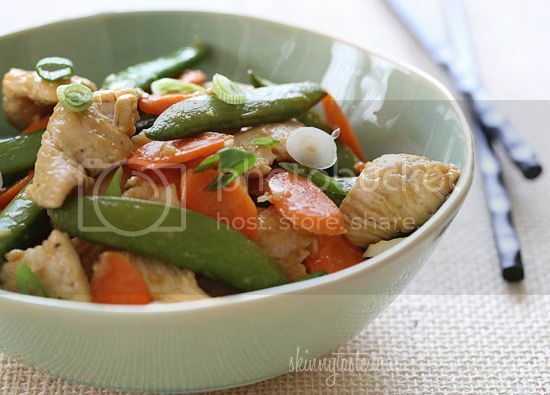 Spoon the chicken to the side of the wok (or remove and set aside to prevent overcooking) and reduce heat to medium. 6. Add the remaining oil to the wok; add the garlic and ginger, stir for 20 seconds. 7. Add snap peas and carrots, stirring over medium high heat until tender crisp, about 3-4 minutes. 8. Add the soy sauce-lime mixture, mix well and cook another 30 seconds to one minute. Serve and top with fresh scallions. While these are separate recipes and can be enjoyed on their own, I go one step further and serve the chicken stir fry on top of a bed of the cauliflower "fried rice". Amazzzzzing. Who wants to come over for dinner!? Older PostBinge Eating. Symptoms + Solutions.